This week we are working on organizing our crafts when you do not have much space to store your crafts. I live in a one level, three bedroom, 3 1/2 bath home, and I do not have a basement. I have learned how to make my space work for me. Before we start talking about organizing, I want to say that the first step is to declutter and keep just what you have room to store. Sometimes we hang onto things just in case we ever need it, but I have found that it is worth it to me to have to go buy it instead of these items taking up so much of my space. You can read how I had to change my thinking so that I could declutter here. I would love to have a craft room but I do not have the space for one. We do have a three car garage but we like to park two cars in the garage. So I added three narrow shelves to a wall in my garage. I used narrow boards because I still need to get a car in there without bumping into things with the car door. I have a confession. My cheap self did not purchase new boards. I had a broken bunk bed in my garage to throw away, and I used the side boards to the bed for my shelves. The best part was I did not have to paint or stain new boards plus it didn’t cost me anything. Win! The key to organizing is to be able to see everything you have. It is so much easier to craft when you know what you have at home. I organized my stains, sealers, and primers on the top shelf because I do not use those as often. I placed my spray paints on the middle shelf and all my craft paints are on the lower shelf. Can you tell I like to paint? The reason I want to use narrow shelves is so that I can see everything. I found that these crates are perfect for my supplies. I got tired of digging through my husband’s workshop every time I needed a tool so I purchased a few tools of my own. 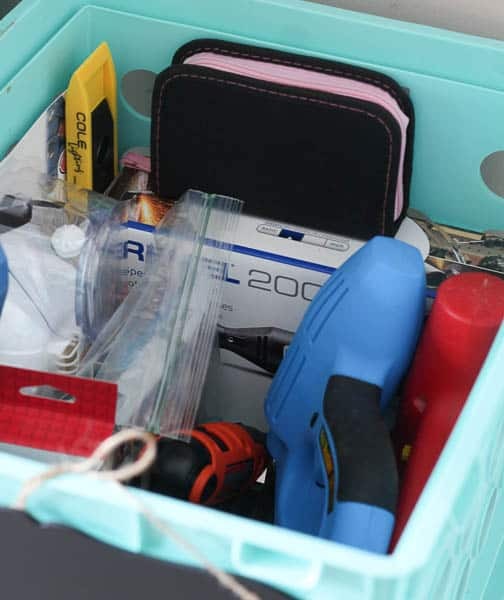 This has made DIY projects and crafting so much easier. I did not spend a whole lot but it was worth every penny to know where my tool is when I need it. The crates are easy to lift and easy to move around. 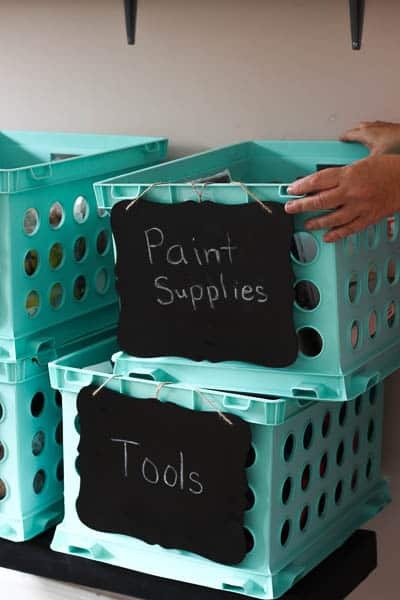 I purchased these little chalkboards and I list the supplies in the crate. I like to make sure all my supplies are separated and placed in baggies. If I didn’t do this, it would be a mess, and I still couldn’t find what I need. 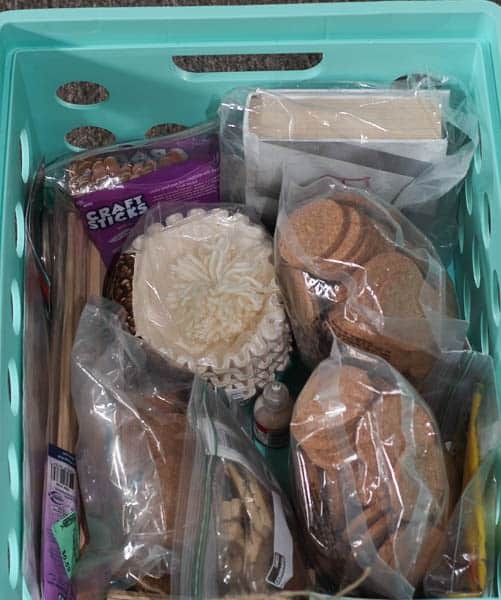 I keep all my different glue, modge podge, and tape in one place so that I can go to my crate and grab what I need easily. 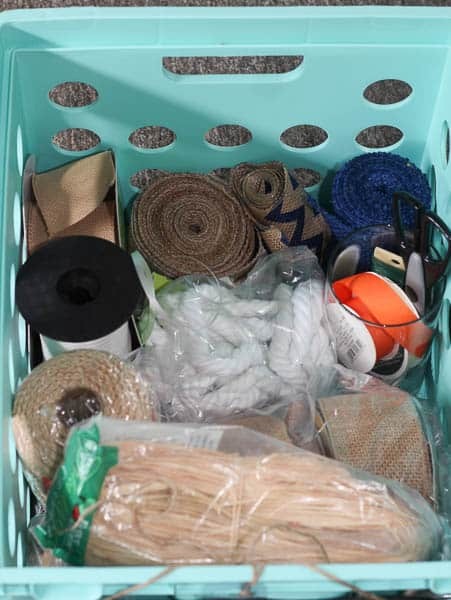 I keep ribbon and twine in a crate and I usually put a rubber band around the ribbon or place it in a baggie so that it will not unroll. A crate for my tools makes me happy. 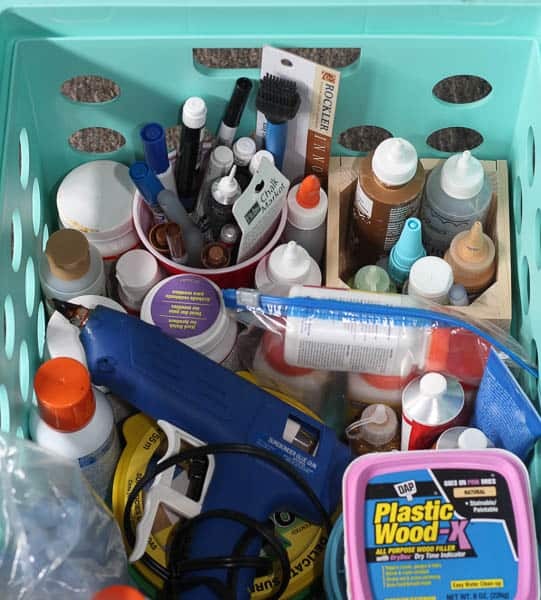 It is so important for me to keep my paint supplies together. 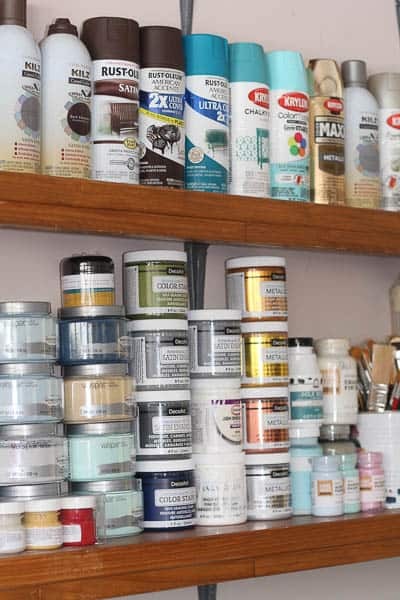 These supplies are not necessarily supplies for craft painting but also for interior painting. 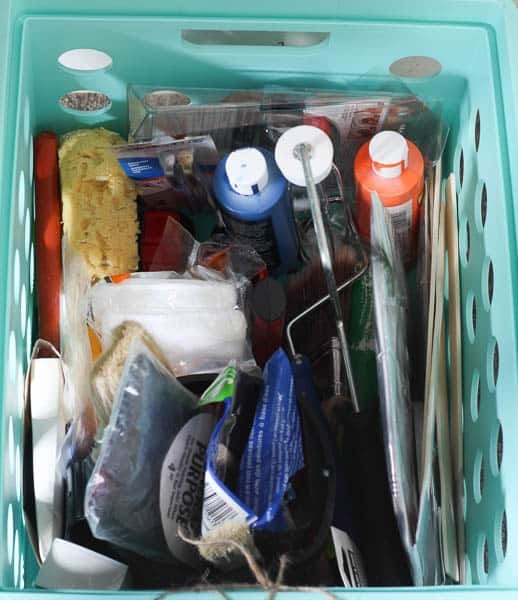 It does take time to organize your supplies, but after it is done, it is easy to keep organized, and being organized will save you so much time, seriously! I hope you see how to organize crafts without a craft room. Even if you only have a tight little space, you can create an organization area that will make your life easier. 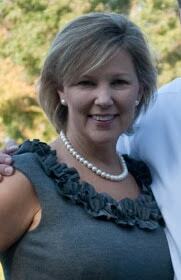 Sherry, you never cease to amaze me. Those narrow shelves for your paint are brilliant! Even if it wasn’t to accommodate a car it makes so much sense. And you are so very well organized…I feel much better about my organization after this week and like you said, just knowing what you have is helpful. Very creative and ingenious way to store your crafts, Sherry! I find for me that I have to get my “stuff” into containers and use labels, as in lots of labels. I purchased a bag of poly filling for something and I’ve got tons of it left. I’m really thinking about donating it cause it takes up way too much room and that’s something we don’t have a lot of since we downsized. I thought exactly what you mentioned and that’s to go out and buy another if I need it down the road. 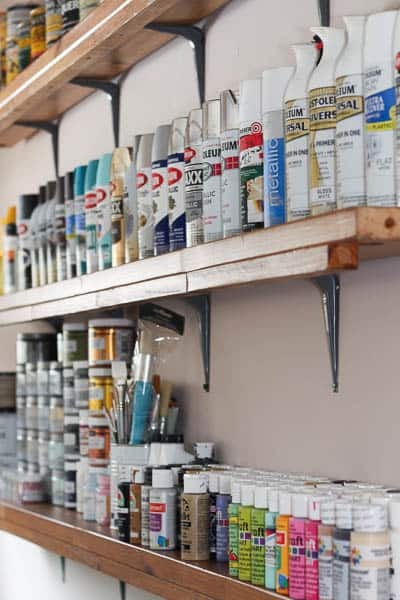 I love those narrow shelves in your garage, they are perfect for storing paints and other supplies, and perfect for any tight space. You shared some great tips here, thanks so much! I can’t believe you repurposed the old bed boards to make your shelves. That is brilliant! I really like the idea of keep narrow shelves so you can see everything. All too often we think bigger is better yet that isn’t often the best solution. Your space would make me want to hide away and be creative. It’s perfect! I love your little aqua baskets with the chalkboard signs! Ingenious storage solution for a small house too!! Yes it does save tine down the road if you’re organized. I just did something similar re: narrow shelving for paint. I don’t have a dedicated craft room either, so I had to commandeer our storage closet! 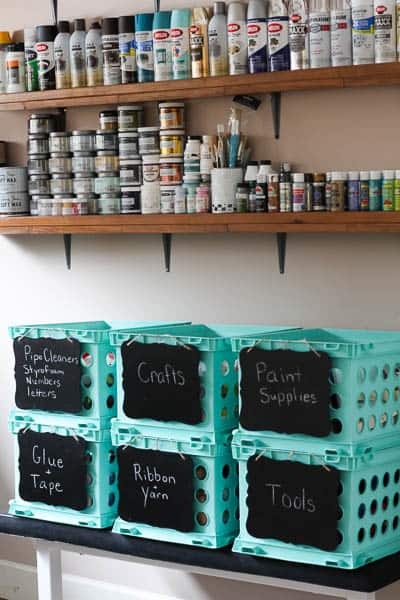 I wish my craft space was this organized! It is on my list of things to do, but somehow, it gets pushed to the bottom of the list. Your post has inspired me!